Stockholm gigapixel. 76 bilder. Skapad med autopano Giga. 1. Because Kolor is the world reference for panoramic imaging solutions. 2. Because you need a robust, reliable and accessible solution. Because innovation and quality are among the Kolor corporate values, our team is committed to the constant improvement of all the solutions that the company offers, in respect of both hardware and software. And because we want the largest possible number of end-users to be able to benefit from our technology, we ensure that they are accessible from the point of view of both usability and price. 3. Because you expect to receive a quality product and impeccable service. Kolors team and EPS as partner are very alert to your expectations in terms of quality enhancement of our solutions. The most obvious example is, certainly, the fact that we take into account the ideas that are suggested in our forums and at our annual users’ meetings. This means that, in addition to all the internal research and development that we undertake, we do not hesitate to add features suggested by our customers, so that we can reach a final technological product that is easy to work with and that answers your needs. And because you need assistance, we place at your disposal numerous documentary and video resources, as well as a technical service to help you if you run into problems. 4. Because you can rely on the expertise of an international community of users. Kolor is also one of the largest global user communities for products related to panoramic photography. You will find technical support and discussion forums, a panoramic image gallery, a calendar of events related to panoramic photography… Sign up for free membership of the forums, and you can join in the discussions and information sharing. Kolor offers solutions for image stitching, the creation of virtual tours and the creation and publishing of 360-degree videos. The following products are developed or co-developed by Kolor. You’ll also find on the Kolor Store products of other brands tested and selected by our team. The reference software in image stitching, many times praised by the specialized press. PRICE: €99. The image stitching software of those who wish to go further. PRICE: €199. The virtual tour creation software for all. PRICE: €99. The professional virtual tour creation software. PRICE: €399. 360° video creation: discover the world’s first complete 360° video solution. Live an immersive experience: launch the video, hold the left click of the mouse and navigate at 360 degrees. With Kolor 360-degree video solutions, it’s easy to record, process and publish 360-degree videos. Kolor selected the best equipment to record 360-degree videos with ease. They are based on GoPro fisheye cameras and let you capture the whole 360×180° video scene. Use Kolor Autopano Video software to stitch the video streams together and export a single video up to 360×180°. Autopano Pro or Autopano Giga are required to take full advantage of Autopano Video. With Kolor Eyes video player, it’s free to share your 360-degree videos and let everyone interact with them. Kolor Eyes lets you display your 360° videos and interact with them: change the projection on the fly, zoom in and out within the video, turn at 360 degrees and apply visual effects. It is available on several platforms and even as a hosting service. WE can either create a simple iOS app or a very customized app to display your 360 videos. Video stitching with the power of Autopano. From PRICE: €299. Kolor Eyes for iOS — Free! View and interact with 360° videos on iPhone and iPad. Free. View and interact with 360° videos on Android mobiles and tablets. Free. Kolor Eyes Desktop — Free! View and interact with 360° videos on iPad. Free. Integrate a 360° video player in your iPad apps. Host, play and share your 360-degree videos with the entire world. Remove the haze from your landscape photos direclty in Photoshop. €39. XnView — Free for private use! The masterpiece of the image treatment: open, modify and convert dozens of images in an extremely easy way. Free for a private use; otherwise €26 and volume prices available. Thanks to its sharp one-piece design and powerful engine, Panogear is able to support up to 4 kg of load (9.7 lbs). Its threaded base of 3/8″ ensures maximum stability in all situations. For most difficult conditions, setting the time period of stabilization will prevent any possible vibration. Your panoramic views will benefit from an incomparable sharpness. Control Panogear remotely with the help of the Panoshoot module. Practical, the remote control prevents you from disturbing your shootings whenever you want to change a setting. It also offers you new perspectives, such as to make shootings on a telescopic mast. Install your DSLR on the Panogear, connect them together using the incuded trigger cable and start your shooting within couple of minutes. With the simple and intuitive interface of Panoshoot, you are able to start with a few clicks. Behind the apparent simplicity of Panogear hides an innovation that ensures the stitching quality of your panoramic images. Accurate to the quarter degree, Panogear can also automatically save the files describing your shots (XML file). Based on an astronomical mount, the Panogear is precise and allows to shoot gigapixel panoramas thanks to a 0,25 degrees reading precision. The Panogear is compatible with almost all DSLRs. Please check our compatibility chart: List of compatible cameras . Canon 5D MKIII is not compatible in terms of body size, you won’t be able to set the nodal point. Assortment of 7 trigger cables which allow to connect most of the cameras on the market to the Panogear head (allow to pilot the camera remotely). 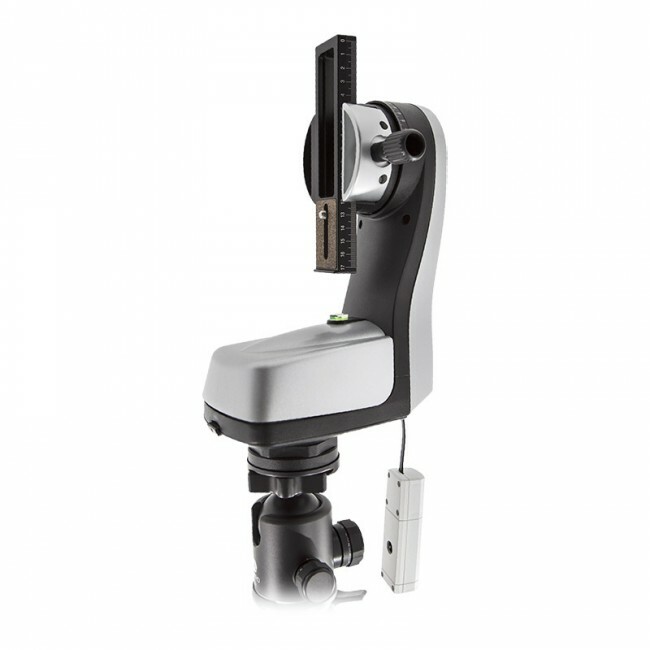 Robust and easy-to-use, the simple bracket can be used directly on the Panogear head or connected to the provided L-bracket. The battery charger allows you to recharge the batteries of the Panogear head. Comes with its power cord and car plug. The two Li-Ion batteries of the kit allow you to have greater autonomy for your Panogear head. The batteries enable to shoot during nearly 11 hours without recharging.